Don't waste paper and money using disposable lint rollers to remove pet hair from your clothing. All you need is a simple pair of rubber gloves. Actually you don't even need a pair. One glove will do! 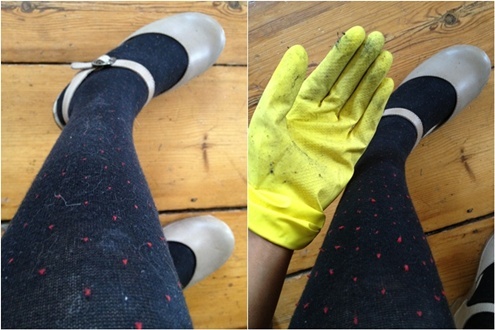 Removed cat hair from my cotton tights with a rubber glove. Put on a clean rubber glove. Rub garment in one direction with the glove. Repeat as necessary. You'll notice all the pet hair clumps on the glove. Watch this video to see Green Cleaning Coach Leslie Reichert do it! We're sitting Lucy 2.0, our downstairs neighbor's adorable long-haired kitty, this week. She was kind enough to lend infuration for this post. My mom has a long-haired mini dachshund and uses this technique on her couch. I bet it works with a variety of pet hairs and fabrics. Try it and let me know how it works with your pet hair situation. Also tell me, what's your favorite pet hair remover trick or product?